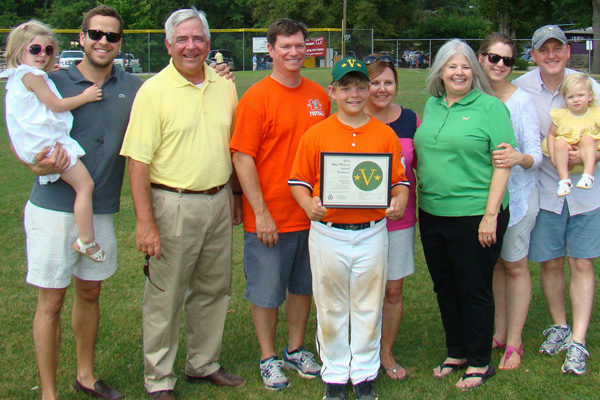 Henry Meyer, the son of Paul and Kim Meyer, has been named the 11th winner of the Mike Weaver Award at a May 31 ceremony at Vine Ingle Little League . 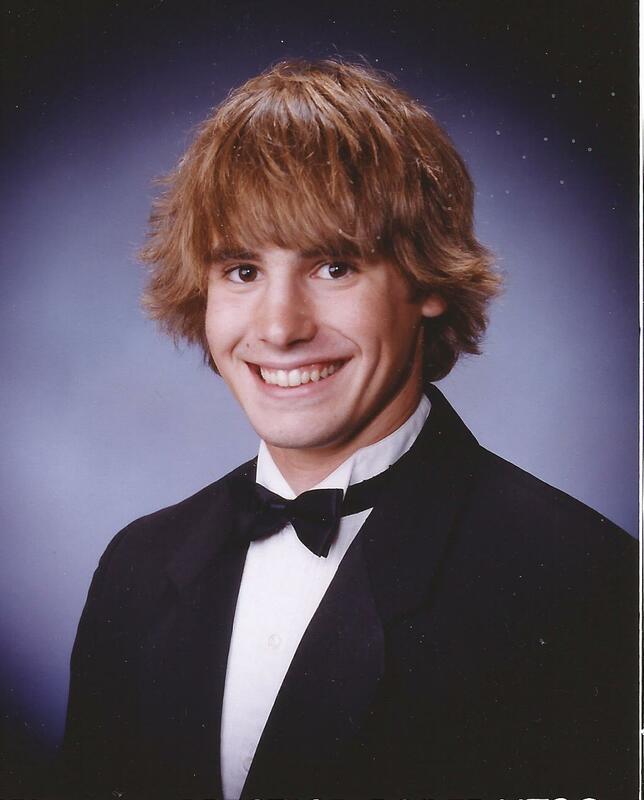 Henry was selected from 10 nominees, one from each of the teams in the Major League. 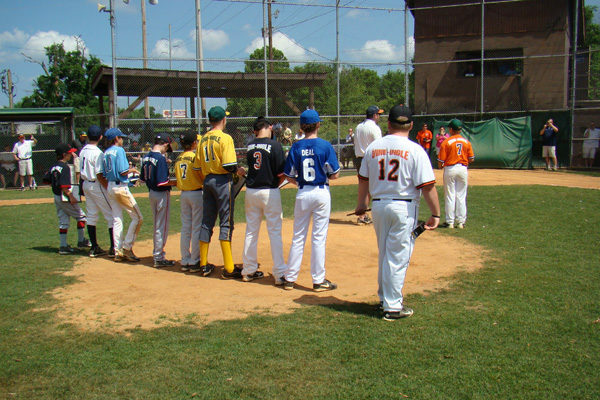 The nominees, shown in the first two rows in the photo above, were, from left, Cole Rowland (Orioles), Luke Dasher (Pirates), Bo Crook (Giants), Camden Lashley (Red Sox), Miles Morris (A’s), Henry Meyer (Astros), William Deal (Dodgers), Daniel Cohen (Royals), Max Hershberg (Yankees) and Matt Rose (Reds). 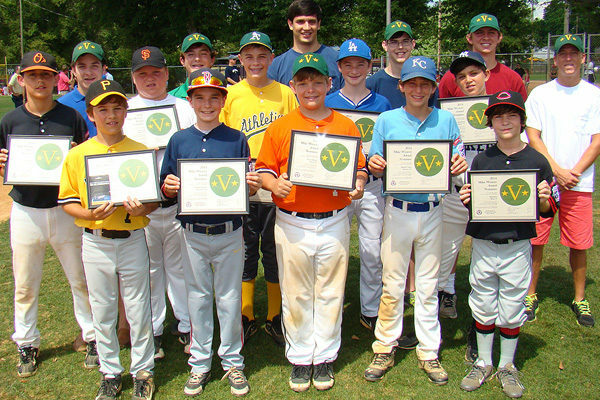 Henry is pictured above with some of the previous winners of the award, from left, Wade Snow, Jay Spivey, Drew Edge, Matthew Maier, Adam Barth and Chandler Lord. The Weavers posed for a photo with the new winner and his parents, from left: Mary Michael Patterson, Dan Weaver, Bill Weaver, Paul, Henry and Kim Meyer, Erin Weaver, Molly Weaver Patterson, Brad Patterson and Sally Patterson.